Oh boy, have I got a story for you. I set out to make these eclairs for a Mad Men-themed party that my parents (who don’t, by the way, watch Mad Men) were going to. I’d been looking at a few different recipes for weeks and was rather excited to finally be making my first pâte à choux, the pastry behind eclairs, cream puffs, gougères, profiteroles and all things good in the world. I bought all of my ingredients and set out to make the dough. It was a breeze! Easy to make and easy to pipe. I popped them in the oven for ten minutes, rotated my pan and set the timer for another ten minutes, watching eagerly as they puffed up perfectly. I took them out a few minutes early, because my mother claimed they were starting to look a little too brown, and I pricked each eclair with a toothpick to let out the steam. But lo and behold, each one sank! My beautiful little puffs were now flat pieces of dough. 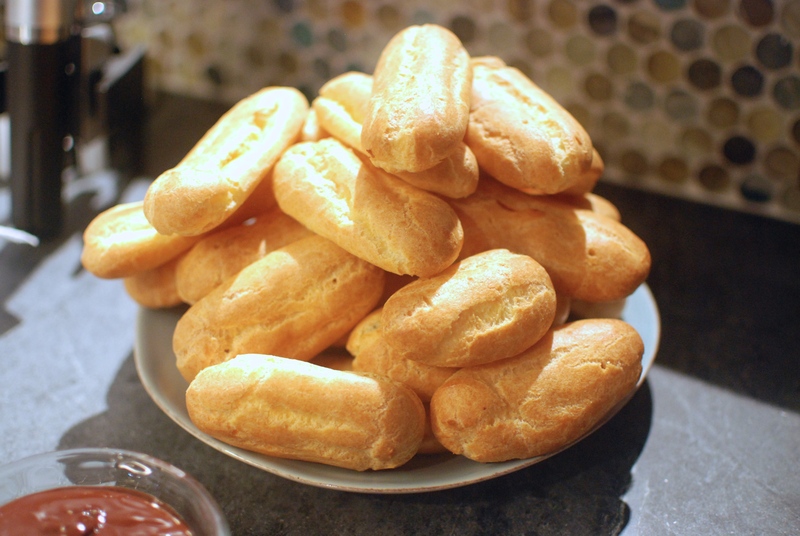 I still had another tray of piped choux, so I stuck it in the oven and prayed that all would be okay. I left them in for the full amount of time, before breaking one open to find that it still wasn’t hollow, and therefore not done. I left the puffs in for another three minutes for good measure, then continued as I had before, pricking each one with a toothpick. This worked much better, but I still wound up with a few deflated eclairs. At this point, I had about ten useable puffs, and I was to feed about twelve people. So I quickly made my pastry cream, which little did I know had to set for two hours anyway, then proceeded to make pâte à choux number two. This time, I left each tray in for a good 5 minutes extra. Finally, I had a sizable amount of good eclairs. But I wasn’t done yet! 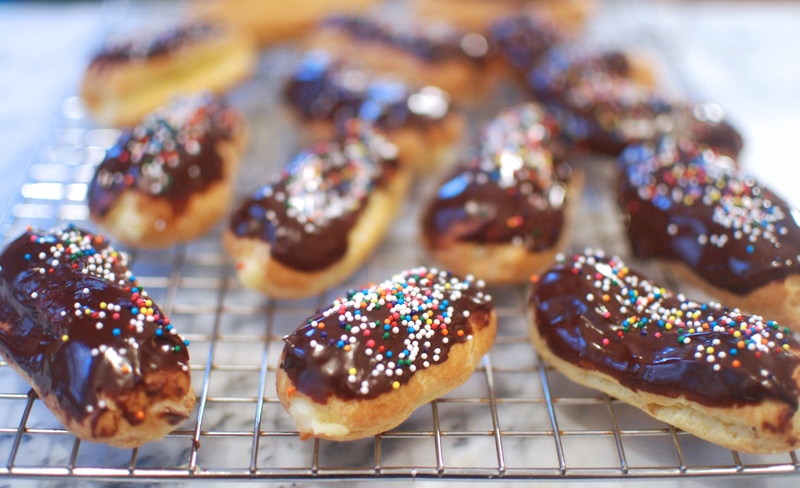 There was still ganache to make and eclairs to dip and fill. Oh, and did I mention that I had been taking photographs this whole time? Yeah, well, there was that. But in the end, I wound up with 20 or so beautiful eclairs, which I have been told were a hit at the party. So here’s the recipe, which I adapted from Dominique Ansel: The Secret Recipes and Love and Olive Oil. And don’t worry–with my edits these should turn out wonderfully the first time for you. First, don’t do what I did and start with the dough. 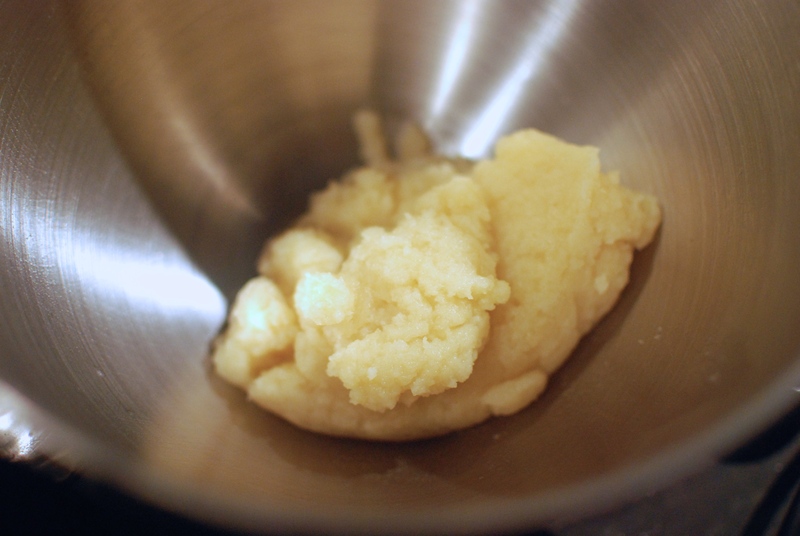 Make the pastry cream before the choux, as it needs to set for a couple hours. 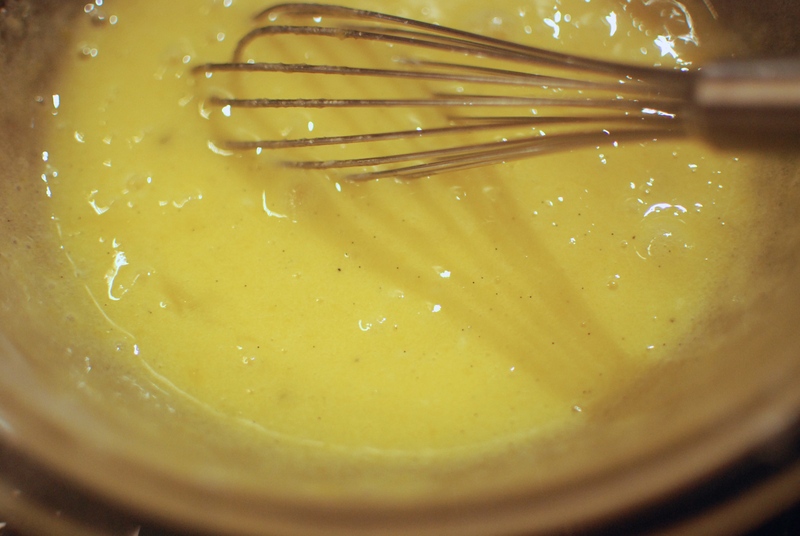 Whisk together some eggs, an egg yolk, sugar, cornstarch, salt, and half a vanilla bean. 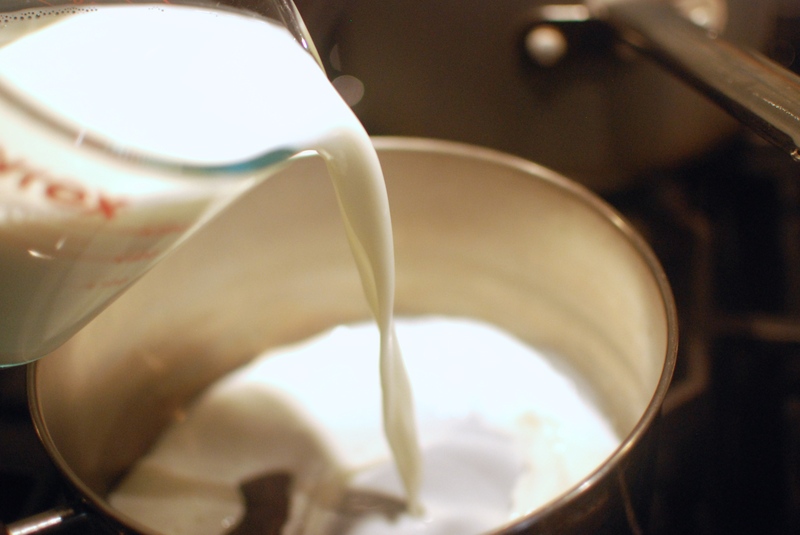 Warm some milk on the stove, then add it in 1/4 cup at a time until the mixture is warm to the touch. Whisk this together with the rest of the milk on the stove and cook until its thick and bubbling. Pour into a heat-proof container, cover with plastic and set it aside in the fridge. Now on to the dough! 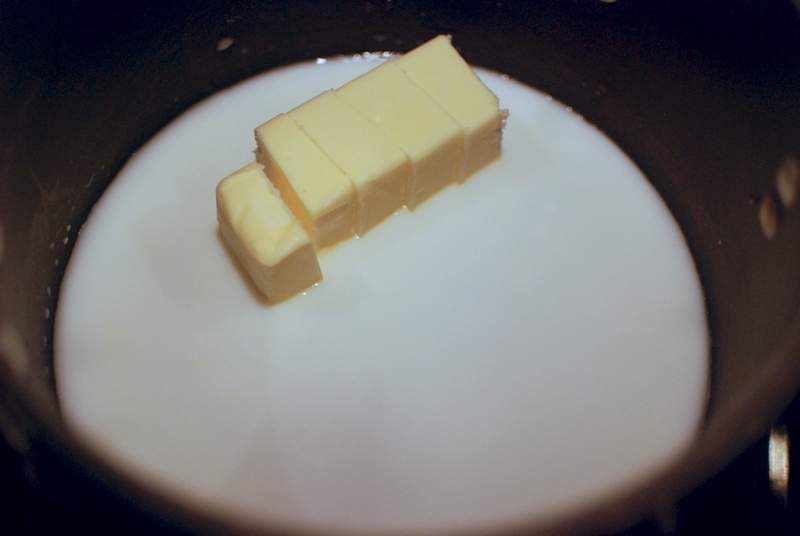 Start by stirring together some butter, milk, water, sugar, and salt over medium heat. Bring this to a boil, then stir in some flour, keeping it on the heat until the dough starts to stick to the pan. Transfer this to the bowl of a stand mixer (or just a large heat-proof bowl if you’re using a hand mixer). 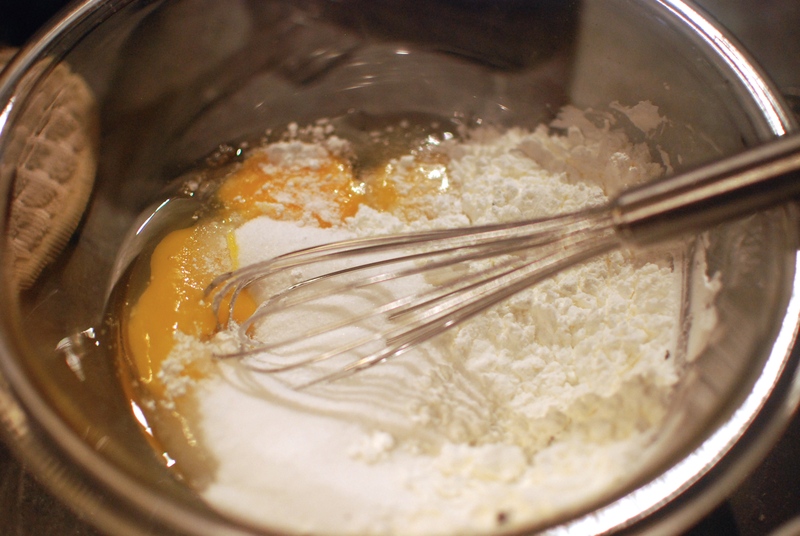 With the mixer on low, add in three eggs one at a time, waiting until each is fully incorporated before adding the next. This is your pâte à choux! 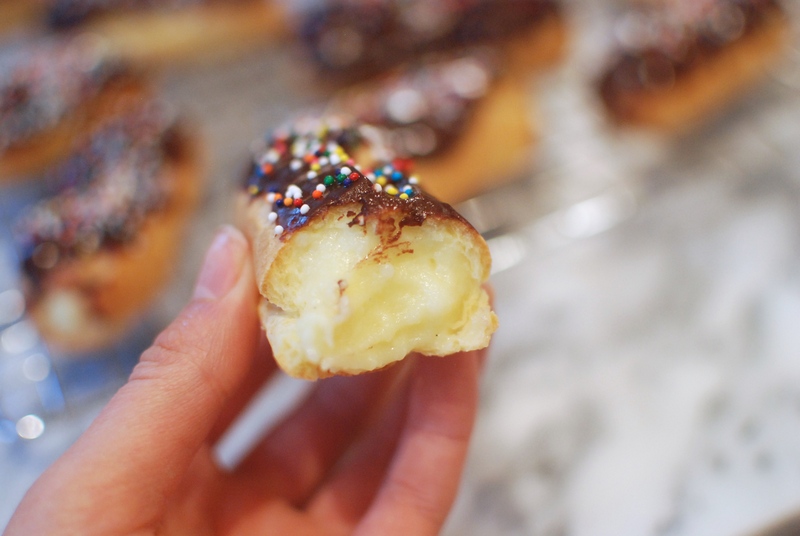 Load the dough into a piping bag with a 1/2 inch round tip (or no tip, like I used here) and pipe out 3-inch logs (the eclairs will be around 4-5 inches long when baked), leaving 2 inches of space in between each one. Bake these one tray at a time at 375 F (or 350 f at convection, as I did) for 13 minutes, then quickly rotate the pan 180 degrees. You don’t want too much steam to be let out! Bake for another 12 minutes or so. 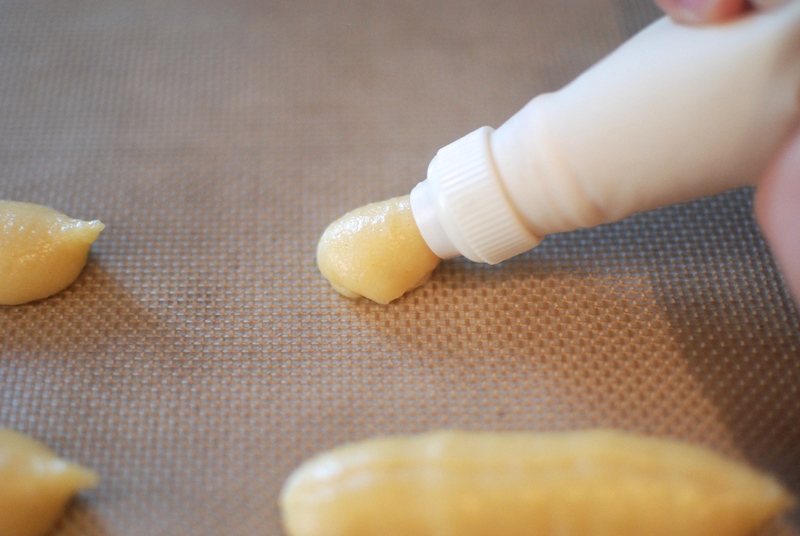 Now, here’s the important part: reach in and take one eclair out, then prick it with a toothpick twice on the top. 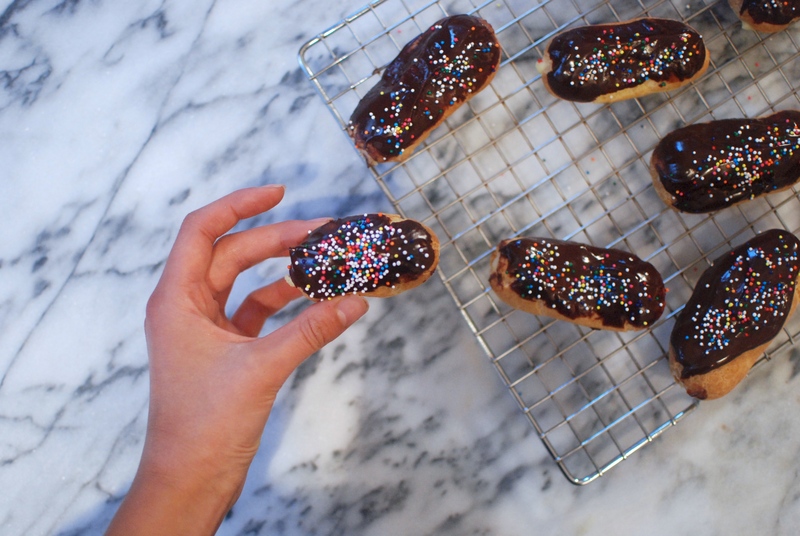 If the eclair sinks (they’ll deflate from the bottom), leave the tray in the oven another 1-2 minutes. Let’s just say it’s a lot harder to overbake eclairs than underbake them. Eventually, you’ll end up with around 20 golden puffs. Yum! 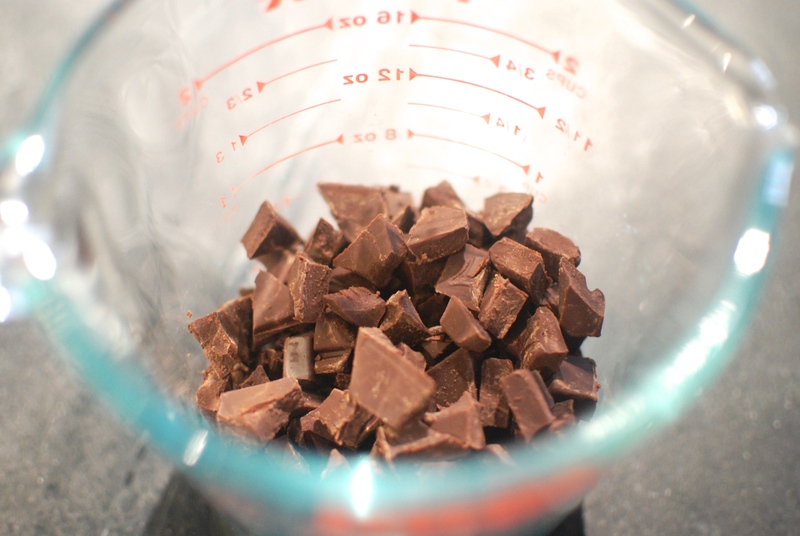 But things are about to get even yummier: Chop up a bunch of bittersweet chocolate and add it to a heat-proof bowl or pyrex measuring cup. And pour it over the chocolate, mixing as you go. That’s your chocolate ganache! Easy, right? Time to assemble the eclairs! 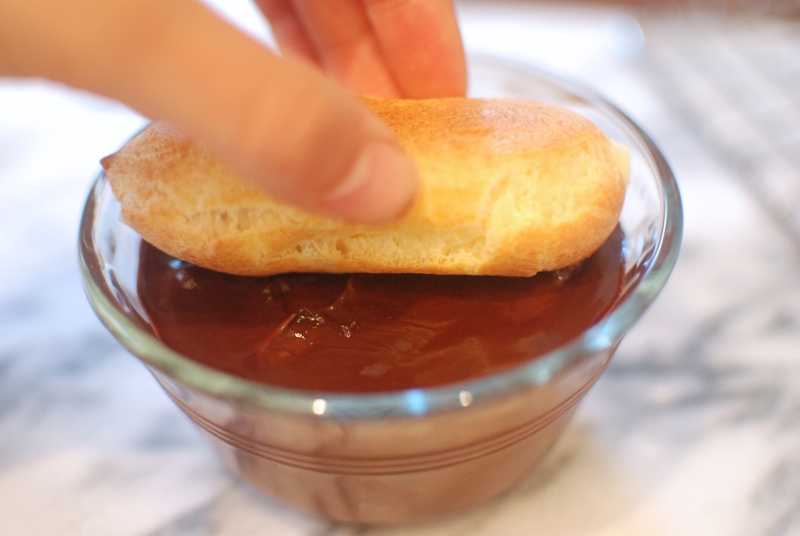 Spoon the chilled pastry cream into a piping bag with a small round tip and pour the ganache into a bowl. Pipe the cream into one end of an eclair until it feels heavy. You may need to pipe some into the other end, too! And add any decoration you want! The world is right again. It was all worth it. Just look at that creamy filling! Perfect with tea or coffee. Or on their own, of course. 1. For the pastry cream: In a saucepan, bring the milk to a simmer. In a large bowl, stir together the eggs, egg yolk, sugar, cornstarch, salt, and vanilla. Quickly whisk in 1/4 cup of hot milk until combined, then add milk by the 1/4 cup until the mixture is warm to the touch (you should have used about 1/2 of the milk). Whisk the egg mixture into the rest of the milk on the stove. Stir over medium heat until the mixture thickens and begins to bubble. Remove from heat and pour into a heat-proof bowl. Cover with plastic wrap and set side in the fridge for at least 2 hours. 2. For the eclairs: Preheat the oven to 375 F. In a medium saucepan, stir together the butter, milk, water, sugar, and salt over medium heat. Bring this to a boil, then stir in the flour, keeping it on the heat until the dough starts to stick to the pan. 3. Transfer this to the bowl of a stand mixer (or just a large heat-proof bowl if you’re using a hand mixer). 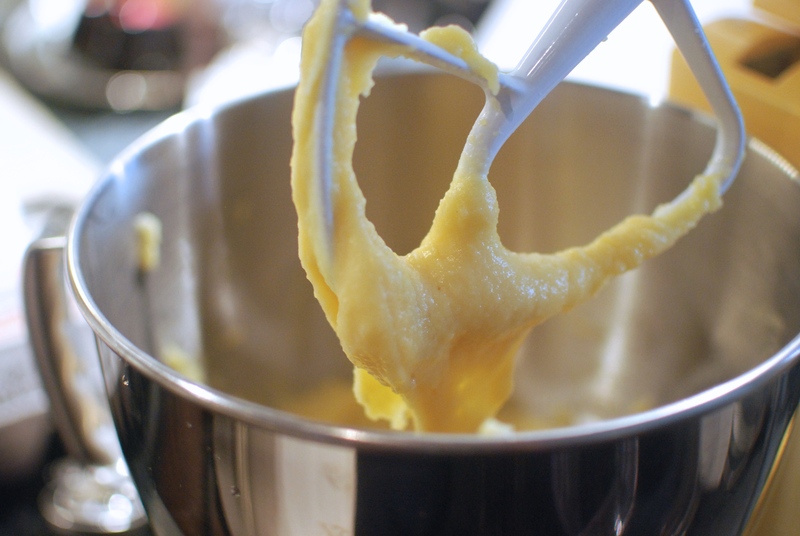 With the mixer on low, add in the eggs one at a time, waiting until each is fully incorporated before adding the next. Spoon the dough into a pastry bag fitted with a 1/2 inch round tip (or no tip; see the mage above). 4. On a parchment of Silpat-lined baking sheet, pipe out 3-inch logs, spacing them 2 inches apart. Bake one tray at a time for 13 minutes, then quickly rotate the pan 180 degrees. Bake for another 12 minutes or so, then reach in and take one eclair out and prick it with a toothpick twice on the top. If the eclair sinks, leave the tray in the oven another 1-2 minutes. 5. 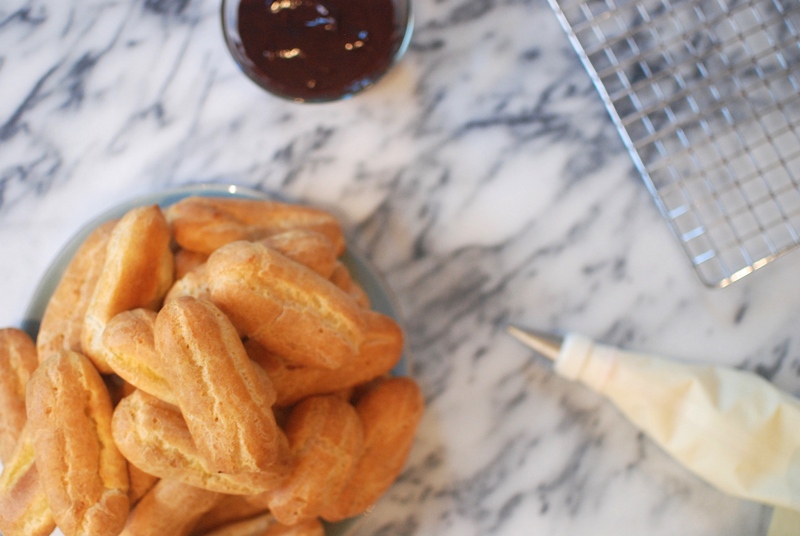 Once the eclairs are all out, prick each with toothpick twice on the top and let cool. 6. For the ganache: Heat the cream in a small saucepan until it barely starts to boil. 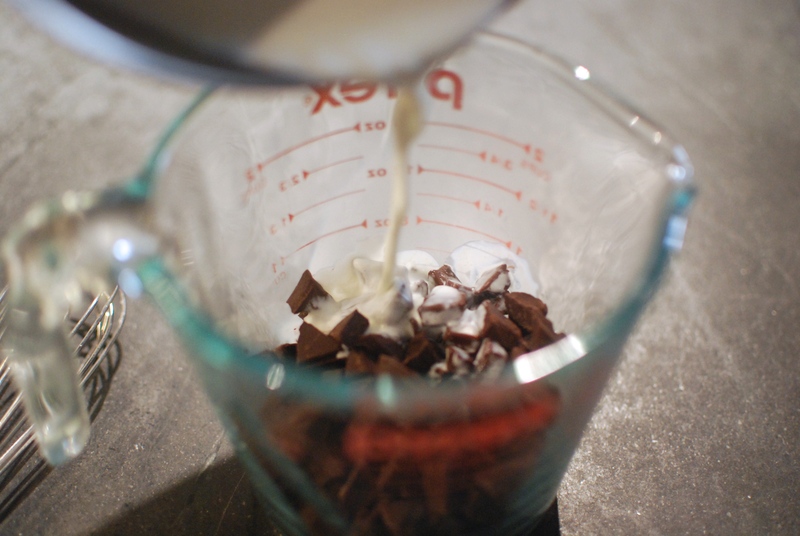 Add the chocolate to a heat-proof bowl or pyrex measuring cup and slowly pour in the cream, whisking as you go. 7. 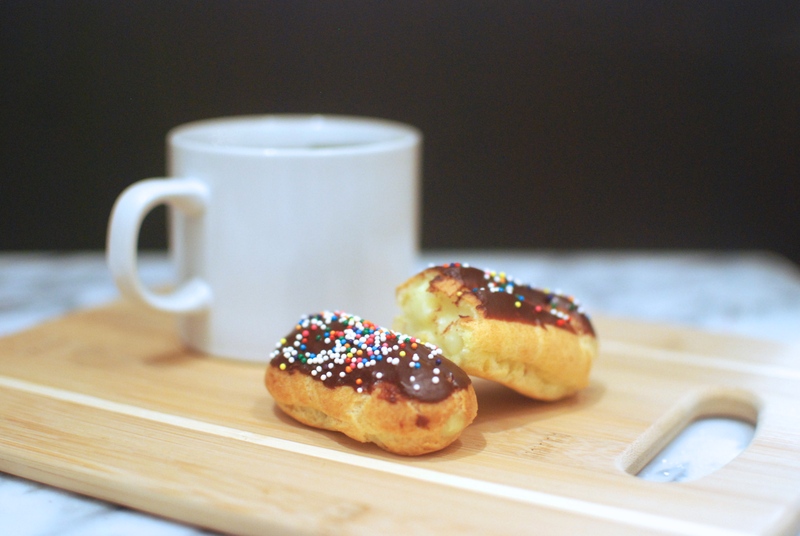 To assemble the eclairs: Spoon the chilled pastry cream into a piping bag with a small round tip and pour the ganache into a bowl. Pipe the cream into one end of an eclair until it feels heavy. You may need to pipe some into the other end, too. 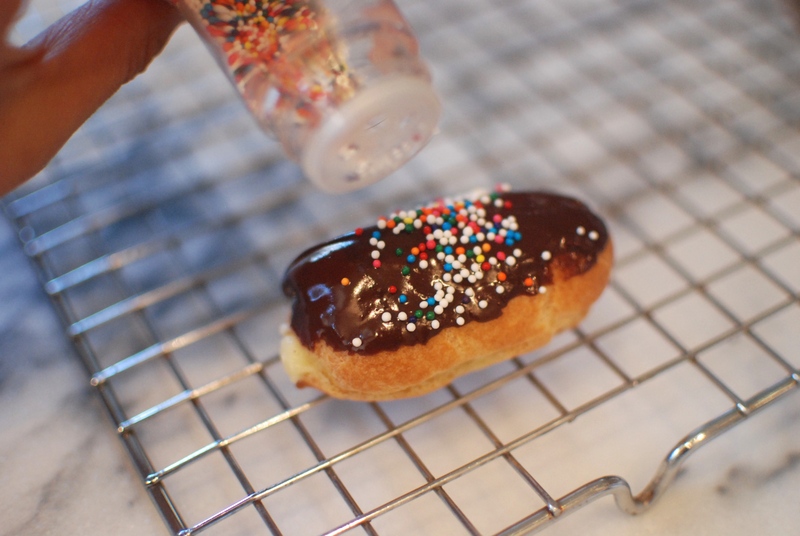 Dip the top of the eclair in the ganache and add sprinkles if desired! That’s about it! I will say that eclairs are much better if eaten the same day. Happy nibbling! What about with a glass of milk? When is Poppie going to taste any of these? I would have eaten the deflated puffs! Beautiful job! Mrs. Debbie Krates from Sanibel! I would have gladly eaten the deflated puffs!